In a forthcoming column in TONIC magazine I have an article about marketing your organisation and refer to several successful tools that the Monarch Butterfly New Zealand Trust has used in the past. A photograph of the large overwintering cluster of Monarch butterflies – the paper butterflies were coloured in by schoolchildren all over the country and mailed to us. Here you can see Ruud Kleinpaste admiring them on our stand. 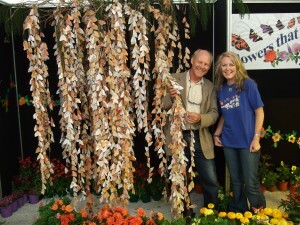 Elsewhere on the stand there were live butterflies flying in a greenhouse with plenty of caterpillars too. Below is the template for the butterflies – it looks much more realistic when it is folded. There was room on the reverse for a message. 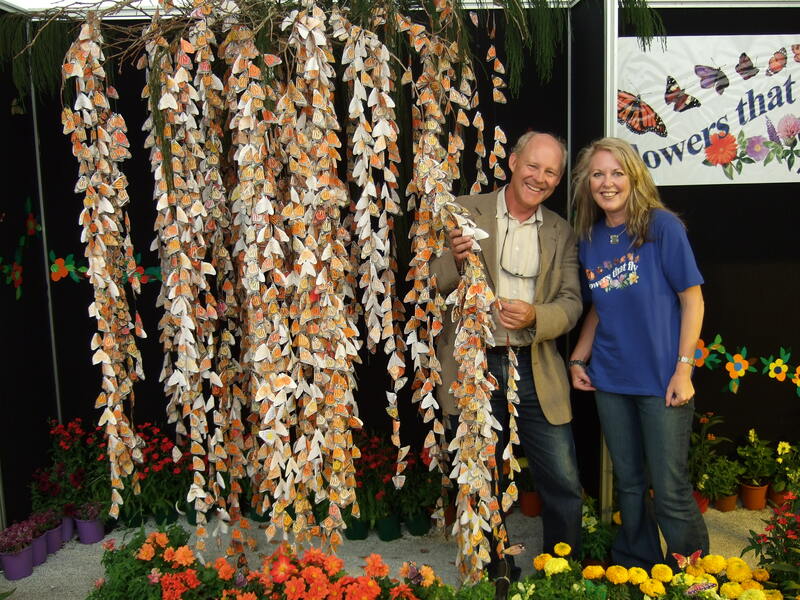 Of course you may not be promoting butterflies – but you can still involve your target market in contributing to a display in a similar manner. The fortune-tellers are available here. We used to make fortune-tellers at school when I was little. They are also called cootie catchers, chatterboxes, whirlybirds and wigwarms. They’re a simple form of origami; and when you’ve made one you ask a question and the fortune-teller operator ‘answers’ after manipulating the fortune teller’s shape. Ours were to promote a conference – and had facts of interest for teachers, parents and children – but you could personalise the fortunes and the facts to be relevant to your own cause – and the poem that you say when you manipulate the device. You are currently browsing the Madam Butterfly weblog archives for September, 2012.